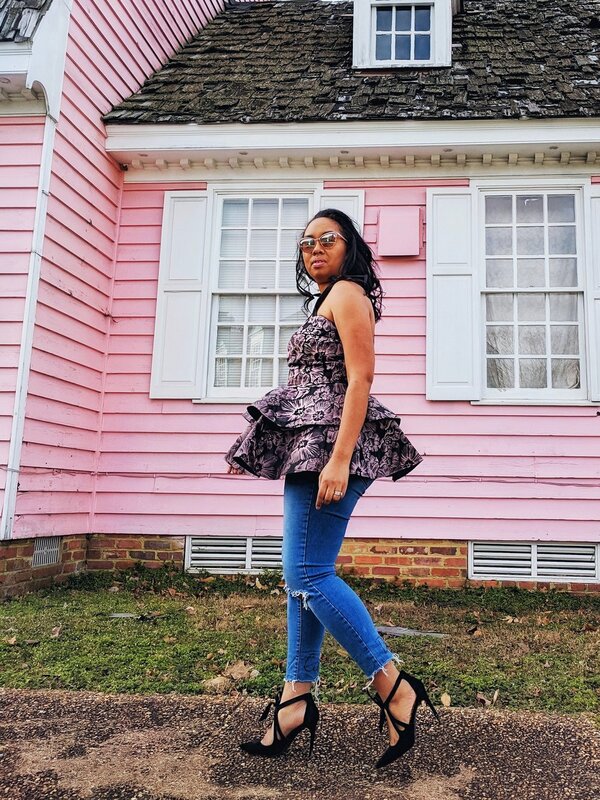 Valentines Day is around the corner and what better time than NOW to make a cute top to style for a date night with your special someone. The fabric that I used for this top was a beautiful poppy floral brocade that I found at Measure Fabric. (May I add, Measure Fabric, literally has the best customer service! I was so happily surprised that they basically put out the red carpet for me. So freaking amazing!!) Can you believe I only used 1.5 yards?! It doesn’t take much at all! It’s such a beautiful color of suave and black and the texture on the fabric is just beautiful. I love how the edges are raised and seems to be popping off the fabric. My kinda style! Ok. Now for inspiration. My favorite blogger of all time (pictured below) inspired this look. As you can see, her top was very structured and the peplum seemed to have some type of stiffener allowing it to hold it’s shape. I also loved the that the straps were satin and of a solid color AND of course the tie straps are definitely my favorite. These are the things that I took away from this design. Want to know how I went about it? Let’s go! The pattern calls for you to interface several of the pattern pieces. In addition to those pieces, interface both peplums with the black interfacing. DO NOT USE WHITE INTERFACING. The way the peplum sits up, you’ll be able to see the white interfacing, so use black so that it blends in effortlessly. For the straps, you’ll need to cut and sew 4. That way, you’ll be able to tie them up.